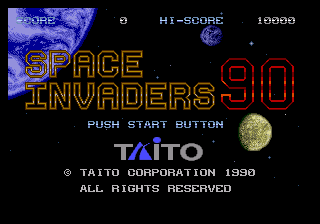 Space Invaders 90 (スペースインベーダー９０) is an update to Taito's classic arcade game Space Invaders, released for the Sega Mega Drive in 1990. Space Invaders 90 keeps the formula seen in the original game mostly in-tact, however instead of having four static shields it gives the player's ship extra hit points. The graphics have been improved and music has been added. Later levels in the game also introduce new enemies with different movement patterns. and shoot. Due to the delay in bringing the game to North America, the game was retitled Space Invaders '91 for this region. In Brazil, the wait was even longer, so the game was simply labeled Space Invaders when it reached Brazilian shores. The game was not released in Europe. Exactly who "The Other People" are is unknown, however Noriyuki Iwadare of Cube created the sound driver (his standard "Cube/Noriyuki Iwadare" driver used in several other games, and in fact, this is the first game to use said driver). Main article: Space Invaders 90/Magazine articles.